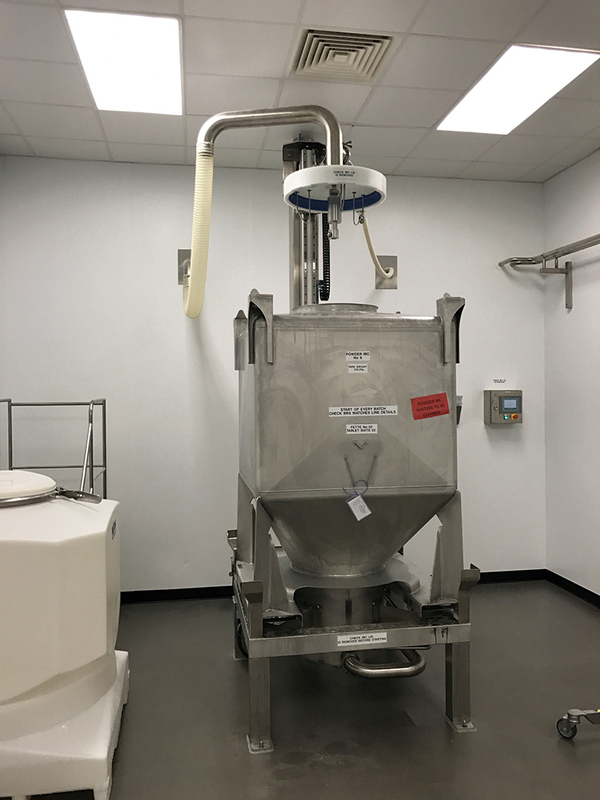 Clean in place (CIP) technology has been around since the 1950s yet even today it is often seen as a low priority when building a process plant. It is, however, a critical part of it and can lead to considerable benefits if carried out correctly at the correct project stage. Dave Adams, systems director, Suncombe, explains. Effective cleaning of process lines and equipment is critical to good manufacturing performance, reducing downtime and assured batch quality. But too often it is not a major consideration in the initial process design. Clean in place (CIP) is a method of cleaning equipment with minimal dismantling and operator/manual involvement. It relies on the principal of applying a suitable detergent or solvent at a suitable flow and/or kinetic energy application, pressure and temperature for a determined amount of time to ensure effective cleaning of the system. Importantly, it has repeatable, reproducible and controllable results that can be validated. It should not be confused with sterilise in place (SIP), which is used to sanitise, disinfect and sterilise equipment, sometimes after CIP, to remove any remaining microbiological contamination; wash in place (WIP), which is usually regarded as requiring more manual intervention and has less stringent validation requirements; and clean out of place (COP), which entails removal of equipment from its area of operation for cleaning. 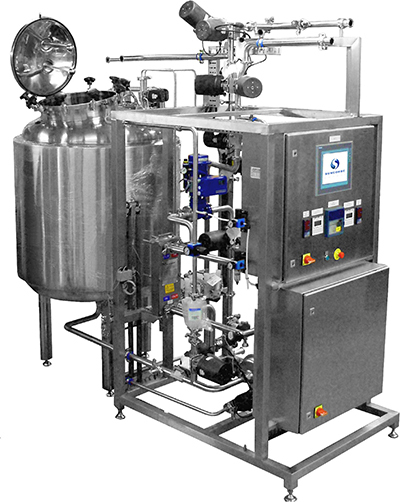 Advantages of CIP include a reduction of cleaning time; automatic cycles to ensure every item is cleaned every time; increased productivity through reduction of downtime; reduced chemical handling; and simplified operational parameters. Each processing installation is a custom-built unit, so the CIP regime it requires varies from application to application. As a rule, the variables to focus on are: temperature, time, the flow rates, method of application and the chemical solution or detergent used (see table 1). In general, the higher the temperature the more effective the cleaning. The effect of temperature optimisation on fats, sugars and salts is good, while on proteins it is fair. The kinetic energy equates to whether the required flow of solution in the pipework is laminar or turbulent, or somewhere in between. In a process vessel, the cleaning effect is usually created by fixed or rotating spray heads. The duration of each CIP cycle step can be optimised according to the following main parameters: type of process equipment; type of process carried out; duration of the process run; cleaning solution temperature; and chemical concentration. The ideal CIP system is one that uses no chemical and just relies on water solubility. This then uses kinetic energy, temperature and time to achieve the necessary results. Many CIP systems, however, need chemicals and/or detergents to be effective. Caustic Soda (NaOH) is one of the most common CIP chemical used. It is relatively economical, even in its validated forms. Other alkali detergents are also used and these are good general cleaners for water-soluble products, fats, proteins and so on. Various acids can also be used (typically at lower temperatures) for additional cleaning efficiency and often also for some amount of decalcification of the equipment. The cleaning regime should be variable while it is being developed, typically in the operational qualification (OQ) and performance qualification (PQ) stages of a project, and should be considered in its entirety: chemicals, chemical concentration, application time, kinetic energy, temperature, and the number of steps. Depending on the residual product to be removed, this will determine the cleaning regime, if chemicals are required, and if so what type. During the washing stage, water hardness should also be considered as it can affect the efficiency of cleaning of aqueous surfactant solutions. Different types of CIP system exist to provide the best solution for any given cleaning regime. These are: total loss; single-use recirculation; re-use (recovery); multi channel; fixed or mobile systems; as well as the WIP and COP options mentioned earlier. Each has its advantages and disadvantages. 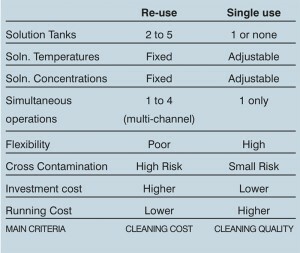 Single-use recirculation systems offer reduced risks of cross contamination while re-use systems dramatically reduce the amount of water and chemicals required compared with a total loss system. However, each has its place in the hierarchy of cleaning requirements. A good CIP practitioner will explain what options will work for a given process and come up with the best, most effective and cost efficient solution. An important aspect of any CIP is that its performance can be measured and validated. Not only can the procedure be validated and repeated every time a cycle is made, but batch and traceability records can be kept. This ensures traceability requirements, as well as other legislative demands, are met. It is more challenging for other cleaning processes to offer this level of transparency. Once validated in the process plant, it can be an expensive and time consuming process to replace and then revalidate a new CIP if the original unit does not perform correctly. Clients often ask why the CIP equipment needs to be constructed to a biopharma standard. One of the reasons for this is the final rinses of CIP systems often involve the final water contacting the equipment before production and hence may need to be of product contact quality. A modern CIP system must take into account not only the cleaning required, but also the environmental impact of the whole CIP process. Energy consumption must be minimised as must the amount of water and chemicals used. In addition, where the water is disposed of, depending on its level of contamination, the careful collection and proper disposal of contaminated chemicals and water must be considered. Thankfully, CIP systems are inherently more efficient in most of these areas. One of the most challenging areas for CIP is to change clients’ mindset. They generally concentrate, understandably, on the production process, thus sometimes underestimate the importance of CIP. By not considering CIP initially, at the design and procurement stage, the equipment may not be fully compatible for CIP. While this has improved in recent years, Suncombe still encounters applications where CIP has just not been adequately incorporated into the design of the production equipment or process. Other challenges include water, energy and chemical usage. Older or ineffectively designed CIPs tend to overuse these utilities whereas modern, well-designed systems minimise all of them. Clients will often challenge the length of time that CIP takes. In many cases this is simply due to design and can often be fairly simply optimised. Realisation of how critical CIP often occurs only when it is not working correctly. If that happens, this can stop or at the least slow production, which can have a major effect on output and costs. Other issues to consider that can be designed out of a process installation include: the cleanability of components and fittings used; safety breaks and circuit separation; prevention of ‘dead legs’ in process circuits; surface finish of tanks and piping; and welding techniques. For example, some rough welding joints are natural traps whereas a smooth weld cleans easily. The same can be said of surface finishing. CIP systems should be manufactured to provide decades of trouble-free operation for the lifetime of the equipment into which it is incorporated. Once a CIP is validated then it is a major (and expensive) task to have to modify or replace it. Building any major structure requires the involvement of teams of experts in a range of disciplines coordinating efforts to get the best result. So, when designing a complex processing installation, involve the CIP experts from the start and ensure you get the best overall build and efficiency for the total line.